Ultrasound was made for the diagnosis of small bowel obstruction. It loves when air filled things are turned into fluid filled things - its helps us see it better. When the bowel gets backed up and distends with digested cheeseburgers, ultrasound is there to save the day. As easy as this may seem, it has not been well studied. There are a few small studies that show it can be accurate compared to a CT, but without a large body of evidence - a lot of people are (quite reasonably) unwilling to put their faith in it. 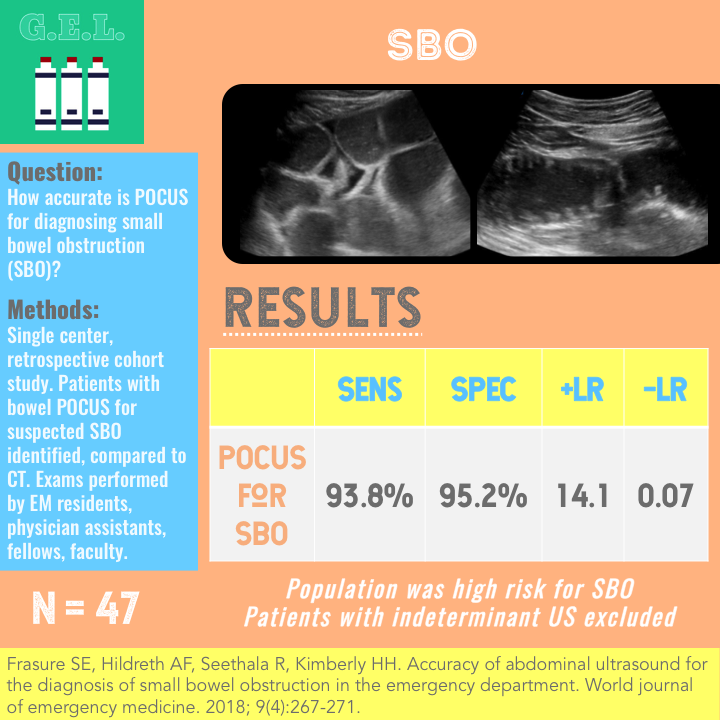 Well, we can't say this study is going to turn all that around, but its one more piece of the puzzle of figuring out how we can use POCUS for this diagnosis. Are you sick of hearing about ultrasound and cardiac arrest? Do you think to yourself - "Why can't everyone just do it my way?." Well - for better or for worse (we think for the better), there are going to be more and more ultrasound and cardiac arrest articles. The reason is that point of care ultrasound can help so much in this situation, yet - it has also been shown to put people at risk for longer times without CPR. So what do we do? 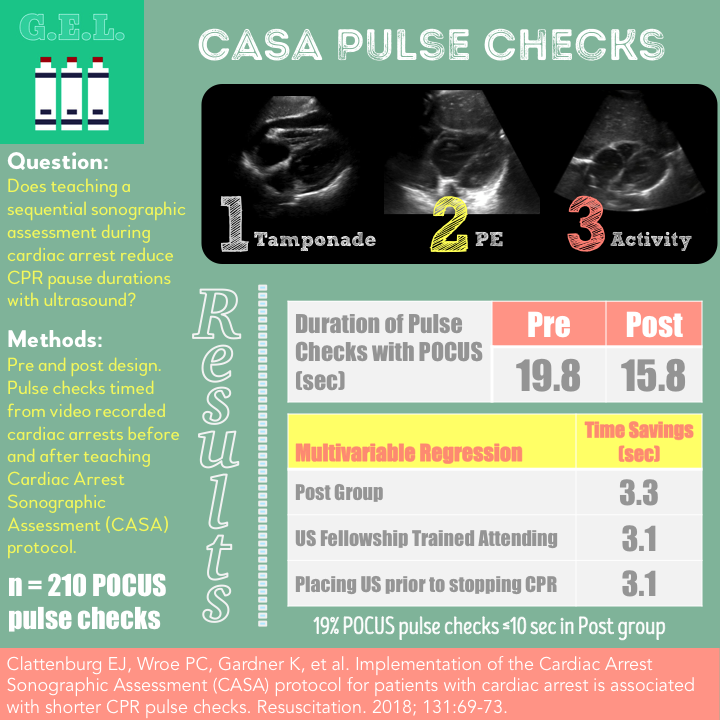 This article presents the CASA exam, a cardiac arrest ultrasound protocol, as a way to standardize the exam and (hopefully) minimize pauses in CPR. The pediatric literature for point of care ultrasound seems to lag behind that of adults. However, it has made some incredible strides to show that this is a tool that is not be neglected in our younger patients. Although point of care ultrasound is used routinely in adults, it may not be as frequently employed in the pediatric emergency department. Clearly, there are differences in cardiac pathology encountered in pediatrics, but the ultrasound can still have great utility. 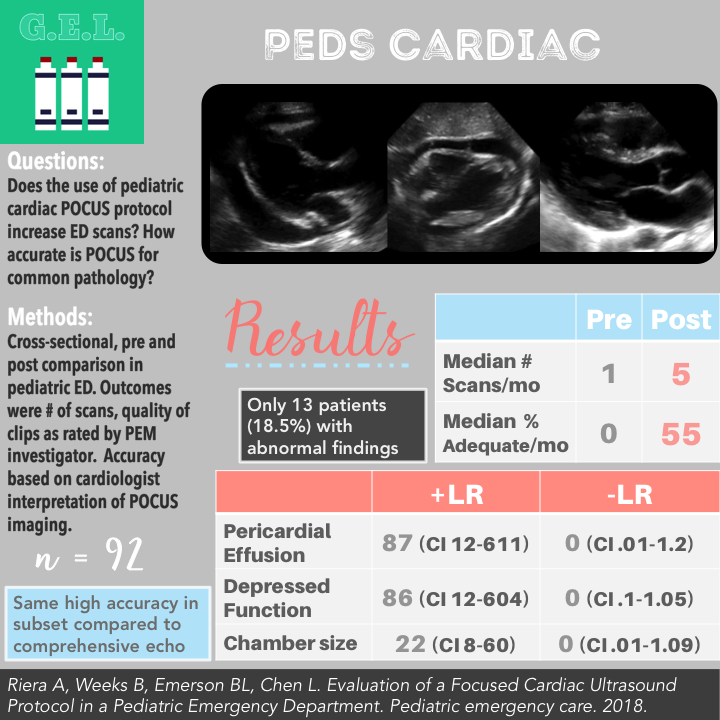 The authors of this paper seek to increase the use of cardiac POCUS by collaborating with cardiologists to create a focused cardiac ultrasound protocol. They collect data to see what happened to POCUS use after they institute this protocol and to see how accurate these scans hold up in kids!